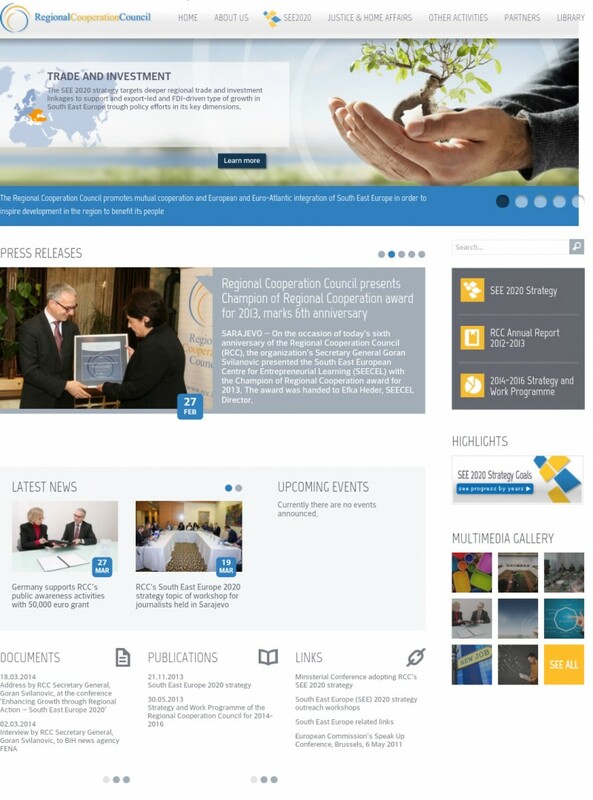 SARAJEVO – The Regional Cooperation Council (RCC) Secretariat launched today a redesigned, user friendly version of the organization’s website and its social media profiles. The website design is upgraded to reflect the RCC Secretariat’s programme-oriented activities mostly focused on implementation of the South East European (SEE) growth strategy – SEE 2020, which is a major part of organisation’s Strategy and Work Programme 2014-2016. Public information and awareness raising activities are of crucial importance for successful implementation of our SEE 2020 strategy. Reaching wider audiences, disseminating information and enabling constructive interaction with the public in the region are especially important during the implementation of the SEE 2020 strategy. Raising public awareness on the importance of this RCC-lead strategy for the overall progress of the region but also on the results of strategy’s implementation and potential bottleneck impeding it are fundamental to achieving our common goals – economic growth and job creation. Besides the generic information on the Home page to do with the mission and mandate of the RCC, structure, news, events, press releases, media gallery, links, etc., the new design of the website enables access to specific information related to background and monitoring of RCC’s SEE 2020 strategy and its main components: education and innovation, trade and investment, job growth, infrastructure and environment and good governance. In an attempt to increase its communication footprint, the RCC Secretariat has also as of recently enriched its public information and communication activities through widening its social media presence via Facebook and You Tube, besides already being active on Twitter for couple of years. These social media feeds are interlinked and available through the newly designed RCC website. The website’s user-friendly features enable users to easily access to website’s contents, upgraded search engine, and more accessible information on topics of interest. It kept the possibility of subscription to the RCC contents such as news and events, press releases, documents and publications that the users have been able to subscribe to so far.